Eric Morgat is a handsome young vigneron whose family own Château de Breuil in the Layon. Eric is representative of a number of growers from the Layon who, since the 1990s, have been either renting or purchasing land in Savennières. 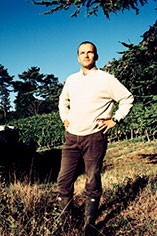 Aged 25, he bought two hectares of existing vineyards (Domaine de la Monnaie) and made his first wine in 1995. At this time there were only six producers in the whole appellation, but with this renewed interest, vineyard plantings have now nearly tripled to 200 hectares. Eric Morgat now has five hectares in production, which he works intensively, de-budding and de-leafing to keep yields well below the rendement at around 30hl/ha. Adopting la lutte raisonnée, Eric prefers to use techniques like homeopathic sprays and cover crop to minimise the use of chemicals. 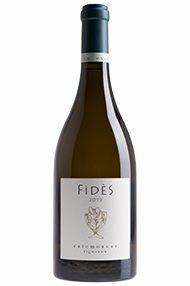 In common with his fellow Layon wine producers, Eric is producing a richer, riper style of this famously dry and austere wine. In the main, this is due to harvesting in tris (selective pickings), on each occasion picking only very ripe golden (and sometimes passerillé or botrytised) grapes. The contemporary style of Eric‘s Savennières L‘Enclos also owes much to its fermentation and maturation in oak, a new and controversial development in this very traditional appellation. Having patiently restored the original domaine, Eric is now expanding the boundaries of Savennières itself. In 2004 he successfully lobbied to bring a one hectare plot in Épire into the appellation. Its south facing ‘vertical‘ slope overlooking the Loire together with its blue schist soils suggest it is destined for greatness. We are unlikely to see any wine from this vineyard until 2010, but we await with interest! In 2005 Eric also purchased half a hectare in the renowned sub-appellation of La Roche aux Moines. He doesn‘t intend to take advantage of using its own appellation to create a separate wine, but rather to use it for bolstering his Savennières. Eric Morgat is the star of Savennieres and the inherent quality of his wines is displayed in each of his cuvees and from year to year. There is finesse and elegance in this cuvee, with a tension and energy that makes pouring a second glass very tempting. Saline, stony mineral core with nervy acidity, with a weight and concentration that makes this incredibly long on the palate.